Ivan Johnson and Nick Young. Two of the most interesting players in our beloved National Basketball Association, less because of their abilities and skills and more because it’s fun to imagine what goes on in their heads while they do puzzling things. I’ve long been thinking that these two men needed to have a formal meeting. Thank goodness for Tuesday night. Their appointment lasted only six seconds, but it tells the full story of Swaggy P and Ivan the Turrrrrible. 0:02 Nick Young shoots 3 (obviously). 0:03 Nick Young misses 3 (not surprised). 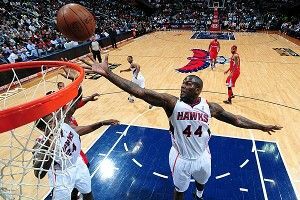 0:04 Ivan Johnson gets rebound (that a boy, Ivan). 0:05 Ivan Johnson immediately passes it and turns it over (obviously). 0:06 Nick Young steals ball (impressive). 0:07 Nick Young immediately goes up for thunder dunk (obviously). Over the course of six seconds, we are reminded that one man, Nick Young, is extremely talented but the epitome of a guy with too much confidence, and the other, Ivan Johnson, might be a cyborg. Can’t wait for the rematch in the NBA Finals.